Do meaningful changes get more acceptance or better results? On February 1, 2015 hundreds of Uber drivers were efficiently moving frigid New Yorkers around the city. Exactly one year later, hundreds of Uber drivers are blocking New York traffic by staging a protest over the company’s 15% fare reductions on balmy day in the city. Although circumstances are forever changing, fundamentals always prevail, something I wrote about last month. Scott Green, a Rivkin Radler partner and brilliant labor attorney, further commented “Business should also be aware of the legal risks of such a transition. This new business model typically relies upon a workforce comprised of independent contractors instead of traditional employees. This move has been subject to a host of legal challenges against Uber and others. Not only is taxation a major flashpoint, but independent contractors lack many of the basic statutory protections of employees. Some are pushing back. A number of high profile pending litigations could determine whether traditional principles of the employer-employee relationship win the day.” His words rang prophetic today! Uber’s app may be transformative, but their underlying business model is captive to same universal truths impacting businesses throughout the ages. From a pure business perspective, Uber cutting prices to attract more riders makes a great deal of sense; a proven device to increase demand. Uber’s New York General Manager, Josh Mohrer also applies sound business logic by arguing that more riders induced by lower fares will substantially increase utilization rates, thereby actually increasing (driver) earnings. What appears to beUber’s app missing is the most critical fundamental of all: transparency, effectively communicating a company strategy to critical stakeholders to get proper buy-in. This, too, is something I wrote about last month. 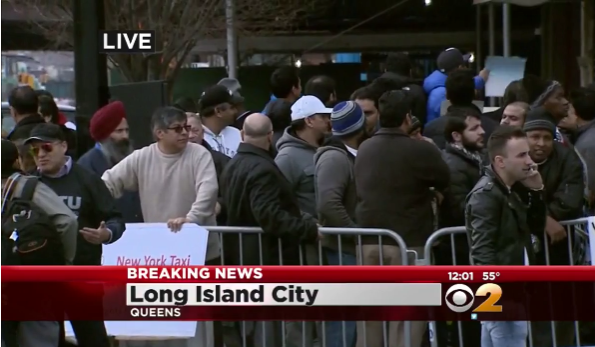 Instead of taking to Glassdoor to vent frustrations, Uber’s NY drivers are taking to the streets. Ironically, Uber scores among the highest on Glassdoor, with an aggregate ranking of 4.4 out of a maximum 5 stars, from over 1,000 employee reviews. Just as GoPro set themselves up for an external and external backlash since announcing their staff reductions well after the indicators suggested they take action, Uber could have prevented this turmoil by getting out ahead of the action with proactive, involved, management. “People hate change” is as true or false a cliché as management allows it to be. Change without context allows employees (or contractors) to draw their own conclusions, a recipe for undermining unity. Change that comes late, however, suggests management is not in control of the business, and thus provides an invitation for organizational erosion. But when management includes critical stakeholders (and initiates even more painful changes), by stating a strong case for how it will benefit the whole, overwhelming evidence shows that employees will not just support it, they will rally behind necessary change. Today, Uber’s NY drivers started pushing back in a way Scott Green seems to have predicted a month ago. If Uber’s management fails to get control over all critical business fundamentals, Scott’s other warnings may also play themselves out with consequences more dire than angry drivers protesting. Love this, Mike. So many of the world’s problems could be solved by better communication!